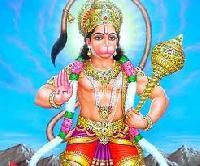 Hanuman, you have limbs as strong as the mace of Lord Indra, your wisdom and good sense eradicates all the darkness of evil thoughts. 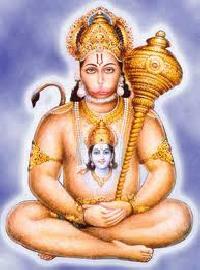 Hanuman, you have a golden skin and your dress suits you well. You wear ear-rings and have beautiful, curly and shiny hair. You carry a lightning bolt and a victory flag and wear the sacred thread called janehu on your shoulder. You are a descendant of Lord Shankar or Shiva and your inner light illuminates the whole universe. That's why people worship you. You are always eager to listen to the stories of Ram, relishing very detail. 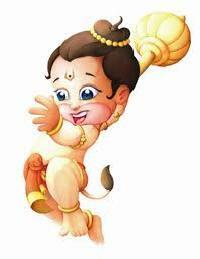 That's why you have a special place in the hearts of Ram, and Lakshman and Sita. 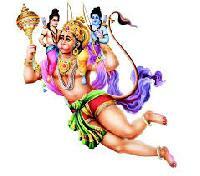 Hanuman you are a magician. You can become a small monkey in front of Sita, but assumed a huge form to burn Lanka. 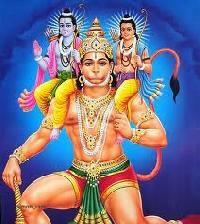 You destroyed the demons by using your over-whelming might and carried out the tasks given by Lord Ram with ease. 01. How was the earth formed?